One of the things I love about having a garden is being able to plant beautiful flowers. Their vibrant colors and beautiful scents can really brighten a gloomy day and it’s just so peaceful being able to appreciate them. I loved planting bulbs, but as a novice gardener, I don’t always know the right bulb to plants and when to plant them. Since moving, I’ve only had the opportunity to grow bulbs in vases, but that’s one of the things that makes bulbs so wonderful. Whether you’re planting in the ground or just using water, you can get amazing flowers from a single bulb. 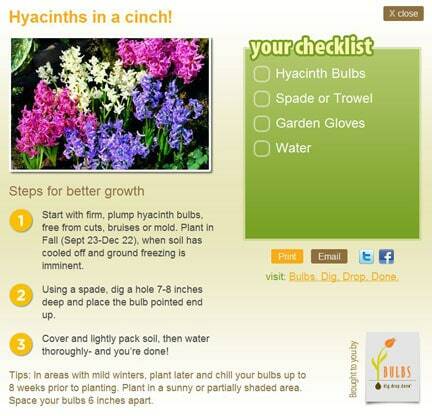 If you are thinking about planting bulbs this year, visit www.digdropdone.com to learn more about bulbs and the best times to plant them. The “ladies” of dig.drop.zone share their advice and tricks to help you get the most out of your bulbs. Marcy, the super mom, cracks me up as she gives her bulb tips while managing a busy household. There’s a wealth of information to find at both of these sites that you can use to help make your garden, or even your windowsill or kitchen counter, look fresh, vibrant and colorful with flower bulbs.